Spoken word artist, singer and songwriter out of Ghana, Delasi (@Delasimusic), shows us images of Ghana that we won’t find on CNN, in his video Where Do We Go? While news flashes of exotic wildlife, beaches, oil money and Hope City are seen on mainstream media outlets, in his video Delasi shows images of poverty and other everyday struggles for many. 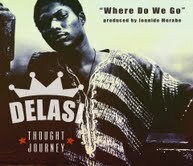 We’ll catch up with Delasi later to get insight into his music, but for now we leave you with the video for Where Do We Go? Bonus: Among other artists, spoken word artist Black appears in the video. You may remember him from an earlier post we did on Ghana’s Independence Day in March. After watching the video, what questions do you have for Delasi? We’ll add them to our list of questions for our upcoming interview with him.